We’ve always wanted to have a neighbor just like YOU! We’ve always wanted to live in a neighborhood with YOU! But really—while we’re sad that our neighbors are heading off, this means their 3BR/2BA Arts & Crafts house (which is actually two houses on one lot, with a newly built 2BR/1BA cottage in back) is for sale. And just down the street, another neighbor’s 2BR/1BA TIC unit is for sale (sorry, this one seems to be in escrow or otherwise off the market!) in an Arts & Crafts fourplex, which means we get more fun new neighbors. It’s been nearly three years since any homes on our block have turned over, so I’m excited to see who’ll be moving in. If you read this blog regularly, you probably know that I think we have a pretty awesome little block and ‘hood. But I figured this was as good a time as any to spell it all out. Not one or two but THREE great weekend farmer’s markets: one on Saturday (Grand Lake), two on Sunday (Temescal and Jack London)—and that’s not even counting the Friday Old Oakland market! More religious and spiritual spaces than I can list! Our neighbors will fill a whole table at our wedding…’nough said! We got incredibly lucky when we landed on our street—the people we share our block with are pretty awesome, and I love that we live in a place where people still sit on their front steps and talk (okay, or drink homebrewed beer and amazing whiskey sours made with backyard lemons…) Dog-sitting? Baby-sitting? All covered! If you move in, we will give you bushels of persimmons! (Okay, actually we’d give you bushels of persimmons anyway, but you get the idea…) I have a lot of fun trading fruits and vegetables with our neighbors, and collectively our block has lemons, oranges, apples, figs, loquats, cherries, more lemons, pomegranates, persimmons, plums, even more lemons, tangerines, and more. There are also plans afoot for a communal chicken coop in one neighbor’s yard. Yep, we’ve got one of these too. And because we have all sorts of different work schedules, there’s almost always someone around, keeping an eye on what’s going on. We have access to each others’ homes and cell phone numbers to call if a dog gets out or a garage door is left open. For city living, that’s hard to beat. 8. Inside the Shan Dong delivery radius! Think you want to live in Temescal or Glenview? Well, I’m sorry to break the news, but Shan Dong won’t bring you any dumplings there! This is the place to be if your favorite late-night snack involves handmade noodles and steamed buns, since they’ll only deliver within 1.5 miles of the restaurant—and we just squeak in. Mmm! Our street hosts an annual National Night Out party every August (this year’s will be August 3rd) and we’ve been talking about trying to have block parties more regularly in the summertime, too. Come check it out and meet the neighbors! In the time that we’ve lived on our street, I’ve learned a lot about its history (much of which is documented here) and the rich history of this neighborhood. I’m a lover of old houses to begin with, and the more I learn about the families who’ve lived on our street over the generations, the more connected I feel to it. Our neighbors are talking about having a 100th birthday party for their 1912 home, and it’s pretty cool to know that at one point, two brothers lived on our street, one in our home with his family and the other in theirs. And our next-door neighbor’s house was built by the same family that built ours, so we love to compare notes on what’s been changed or kept the same over the years. If Arts and Crafts homes are your thing, there are some great examples tucked in amidst the mid-mod buildings that abound in our neighborhood. Have a question about our ‘hood? Feel free to send me a note, and I’m happy to answer it. Disclaimer: I have no interest in the sale of either of these properties, other than wanting some awesome new neighbors! For specific information on the properties themselves, you should contact the respective realtors. However, this bungalow around the corner from us had a demolition notice posted a few weeks ago, and I finally got around to snapping some photos. 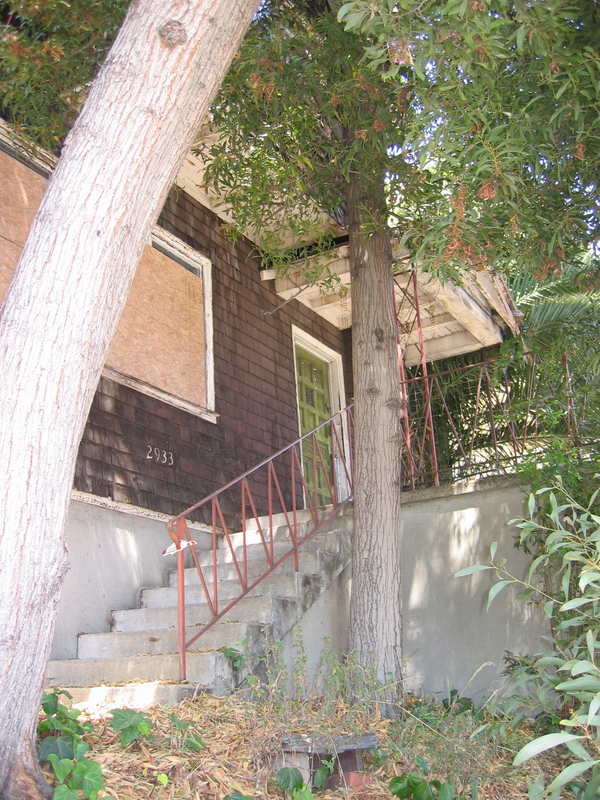 Anyway, the notice says it’s now being demolished as blight abatement. 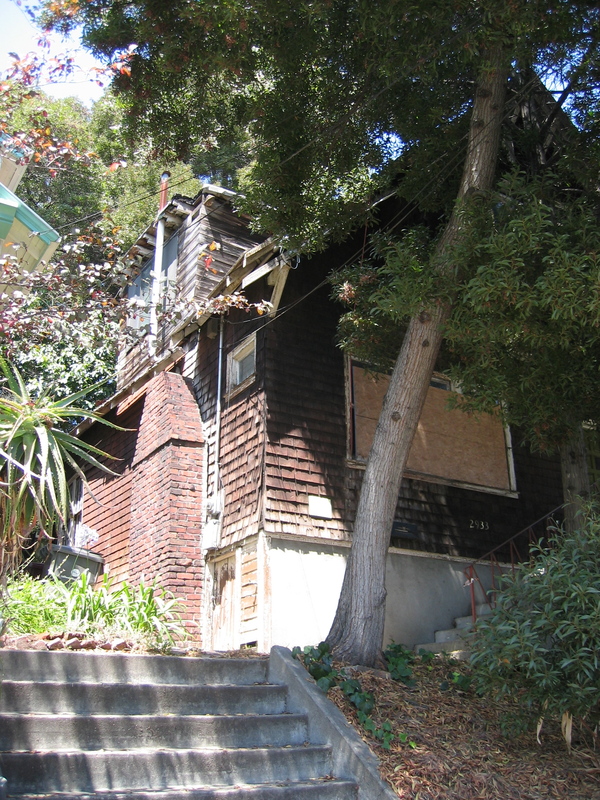 (And it does look to be in pretty awful shape—plus there have been squatters there from time to time, which I can’t imagine did wonders for the interior.) It’s also a little unclear who owns the property at this point, given how much is owed in back taxes. The City? Some third party? The people who just bought the fourplex next door to this house could buy this lot. Next door is a beautiful 1912 apartment building, but it’s pretty much built lot line to lot line, so if they were to tack on this lot, they could create a backyard and potentially even build a garage for parking and storage. Seems like a smart investment opportunity. I’m also pretty curious to see if they salvage anything from within (or if there’s anything worthy of salvaging). When they demolished a house on Piedmont Avenue earlier this year, we were pleased to see that a lot of the innards (including many beautiful redwood joists) were carefully bundled up and trucked off, presumably to some new life somewhere. Who knows what else might be in there? Anyway. 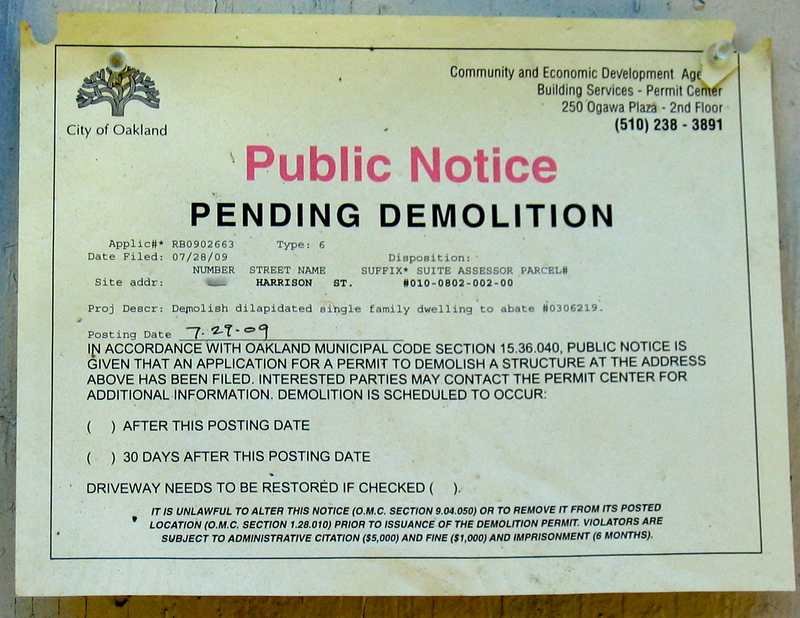 There’s no demolition date listed on the notice (very helpful!) so when I have a moment I may give the City a call to see what’s up, and hopefully find out what lies ahead for this little corner of the neighborhood. In the meantime—so long, little bungalow. Bedtime for Buick: What’s next for Auto Row? One of the key questions at the May visioning meeting that kicked off the Auto Row planning process was this: what street or neighborhood can you name elsewhere in the world that captures your vision for Auto Row? Answers were all over the board. Walnut Creek, Union Square, and Bay Street popped up frequently because of their proximity (or at least I hope that’s why—because ugh, ugh, ugh to all three of those for the center of Oakland!) My personal favorite came from one of the tables of seniors from the Westlake Christian Terrace residence on 28th Street: they wanted it to be “just like [San Francisco’s] Union Square, except with Costco.” People also drew examples from across the country, though (and even a few from other parts of the world). I threw a few into the mix, but kept mulling over it after I left the meeting. Uptown District in Minneapolis, MN: This is currently my top pick as an Auto Row model, and I’m really frustrated that I didn’t think of suggesting it at the meeting itself, since I actually used to live in this neighborhood! It came to mind for several reasons: first, the City of Minneapolis pretty proactively developed this area in the wake of a lot of 1970s/1980s disinvestment, and it includes a number of national retailers like the ones that the City of Oakland seems to desperately want along Broadway. It’s also got a thread of artist and hipster culture, and a number of residents at the first public meeting voiced interest in making Auto Row an extension of Oakland’s arts district, currently centered in (Oakland’s) Uptown. The Minneapolis Uptown District has a critical mass of restaurants and other nightlife, so it doesn’t close down at 6 pm—a major concern I have, given that Auto Row is not only a regional retail corridor, but also my neighborhood’s “Main Street.” The Uptown District is also situated a few blocks from a lake along a major transit corridor—sound familiar? And finally, Minneapolis’ Uptown manages to marry chain retail with local indie businesses in a fairly healthy way (as those things go, at least), which I think will be critical if Oakland sticks to its guns on wanting destination retail along Auto Row. For more information, visit the Uptown Association or Our Uptown or check out the City of Minneapolis’ 2008 Small Area Plan for Uptown. Coolidge Corner in Brookline, MA (just outside of Boston proper): A dense urban neighborhood with a trolley/light rail line running along the center median. Shops with residences above line the street on both sides; there are two lanes of traffic in either direction with ample sidewalks. Cars and trolleys coexist surprisingly well, perhaps because the streetcar line has been there for a century and people are used to its presence. While the area is relatively densely developed—lots are small and buildings frequently run lot line to lot line—buildings are not particularly high. (Currently the by-right height limit is 45 feet, and I’d guess most buildings are somewhere between three and six storeys.) While I generally lean towards the higher end of the height spectrum along central transit corridors, Auto Row may be a good opportunity for low-to-mid-rise development given the number of low-rise historic buildings that I’d like to see preserved (though perhaps built onto, if structural integrity allows?) in some way or another. I’d ideally like to see height scale up as you move west into Pill Hill and scale down as you move into the low-rise residential neighborhoods to the east. The one big problem with using this area as a model, though, is that it’s essentially always had this form—there’s been little to no transition of use involved. For more on this neighborhood, you can check out the City of Brookline’s 2007 Coolidge Corner District Plan. A caveat: I used to live here too, so I’m obviously a bit biased on both of these choices! On the flip side, though, some of the things I loved about Coolidge Corner and “the Wedge” (the little slice of Uptown Minneapolis where I lived) are the same things that drew me to Oakland’s Auto Row neighborhood, so maybe it’s not such a funny thing at all. What other urban neighborhoods are out there that might be compelling templates for Auto Row? So you wanna help plan Auto Row? All meetings will be held at the First Presbyterian Church at 2619 Broadway (at 27th) from 6 pm to 8 pm. 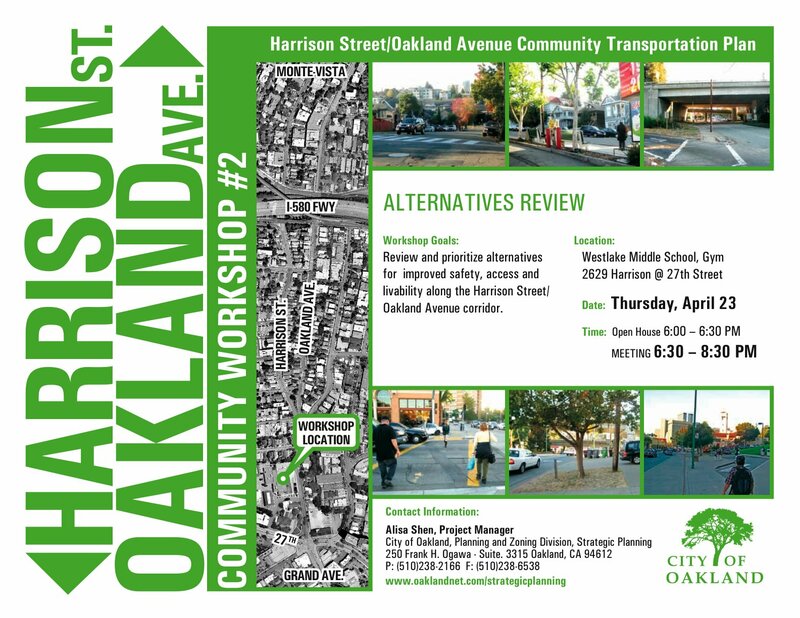 Reminder: Harrison/Oakland CBTP meeting this Thursday! Okay, just another reminder about this meeting! The restoration of Fox—in addition to a number of other incredible historic restorations in the neighborhood, nicely documented here—was part of what drew us to this ‘hood. This is an amazing story of preservation—the Fox has been battered and burned and tagged over the years, and in the 1970s, the city wanted to tear the theater down to make room for a parking lot. Even as the restoration neared completion this winter, the theater had its windows shattered in the January riot. But this is a story of triumph over tragedy: over the years, dozens of Oaklanders have gone to bat for this theater. First Erma and Mario DeLucchi bought it at auction to save it from demolition in 1978; then the City of Oakland got in the game in 1996, buying the Fox from the DeLucchis in the hopes of restoring it. It took over a decade and lots of pressure and support from Friends of the Oakland Fox and other preservationists across the country, not to mention a lot of funding and faith from Hardy Holzman Pfeiffer Associates, the design firm that developed the master plan; Phil Tagami of California Commercial Investments, the lead developer; the National Trust for Historic Preservation; Bank of America; the Charter School Development Corporation; and lots of private donors. Today, the theater is an Oakland City Landmark and is listed on the National Register of Historic Places. The Oakland School for the Arts, a public charter school offering instrumental and vocal music, visual art, dance, theater, and literary arts, moved into new digs there over winter break. And last night, with great fanfare, the theater finally reopened with a gala celebration, just a few months past its eightieth birthday and just in time for the February First Friday Art Murmur. I can’t wait to go see it in person—sadly not this weekend, which is packed with other wonderful things, but hopefully later this month! Check out the schedule of upcoming shows. As someone with a passion for both history and the creation and restoration of the built environment, this project blows my mind. The architecture and attention to detail are phenomenal, of course, as are the period fixtures and intricate art. But what’s most significant, to me, is the restoration of the Fox as a community space. I’m of the school that historic preservation is not just about the physical, but the functional. Sounds funny, but this is actually an idea that’s hotly debated by historic planners and preservationists. On the one hand you have preservation of a physical space: the architecture, the details. Most people are pretty familiar with that concept. On the flip side, though, is the notion that places play a cultural role in communities. A downtown, for instance, could be perfectly preserved from a physical standpoint, but might not be able to fulfill its function as a city center with the historical spaces. Which is more important? There’s a big balancing act involved here. I see little value in preserving buildings that no longer serve a role in our communities simply for the sake of preserving them (apart from an appropriate sprinkling of museums). But the Fox is a great example of how preservation can marry historic form and modern function. The old Fox was a first-run movie theater, but sadly the number of historic first-run theaters (especially with single screens) is dwindling, and it’s difficult to make them economically viable when they’re up against multiplexes. (Check out nearby Alameda’s recently-restored and expanded historic theater, which took another approach to that dilemma.) So we take the same building and we repurpose it in a way that both preserves the architectural integrity and allows the building to participate in the changing community around it. In this case, we throw in a school, live theater, and a cocktail bar. It’s not exactly the same as it once was, but it’s more viable as an element of the community. In my view, that’s the perfect form of preservation: adaptive reuse of our historic spaces. So welcome back to the neighborhood, Fox Theater! 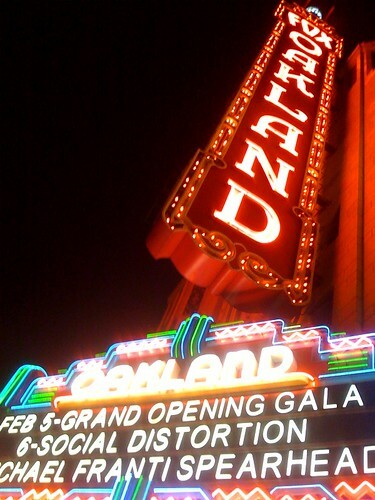 Here’s to the next eighty years of Oakland theater. …and even MORE new restaurants in the ‘hood! Unfortunately, I haven’t made much progress on the existing list of new neighborhood restaurants to try….but apparently I’ll have a whole new batch to add to the list in 2009, says the Chron (and assorted Craigslist ads). I don’t exactly understand this wave, in light of the economy. I mean, I understand that some spots were in the planning stages years ago, but many of these are new leases. Is there an advantage (low rent on longterm leases notwithstanding) to opening a restaurant during a recession? I love the Oakland cornucopia, but sometimes worry for them, especially the brand-new spots. Dopo is opening up Adesso, a new restaurant on Piedmont Avenue that the Chron reports will be a small plates/wine bar style place. We love Dopo, but their line is crazy, so we only go on the very rare occasions when I bike home down Piedmont and remember to put our name in. Maybe the new place will help! It’s also a little unclear where this will be—the Inside Scoop lists the address as 4524 Piedmont, which would put it smack in the middle of Mountain View Cemetery. That’s possible, but seems pretty unlikely. My best guess is that it’s going into the new Il Piemonte condo building, where they’ve been trying to get an Italian restaurant for a while. On the lake, Zax veterans are opening up Sidebar on Lower Grand where Trio used to be. This one’s been on my radar for a while, as they were advertising jobs a while back, but I didn’t realize it was the Zax team. We only ate there once; it was good but not outstanding. Their location on Telegraph near the Berkeley border never quite got them (or any of the restaurants preceding or following them) the foot traffic they needed to stay afloat, though, so we’ll see how the new place goes. Their ads describe it as a gastropub, which sounds promising. Ave Restaurant and Lounge, coming soon to Uptown, will apparently feature “the hottest cocktails” and “New American and World cuisine.” That’s about all I was able to glean from their jobs posting and (not-yet-functional) website…. Finally, still no word on who’s taking over Jojo on Piedmont in the new year. (I’d initially guessed perhaps Dopo was looking that direction—wrong again! Plus, their new spot doesn’t really match Curt Clingman’s description of the new place as “something that nobody else is doing” [on Piedmont, I presume]. So it’s not a pizzeria, taqueria, pub, ice cream shop, coffeehouse, Nouveau American place, wine bar, Italian joint, or Asian or African of any variety. Umm, dessert restaurant? Diner? McDonald’s?) The Inside Scoop does report that James Syhabout, formerly of Coi, PlumpJack Café, and Manresa, among other places, is headed for the East Bay. They don’t say Oakland, but I do—he’s a native Oaklander, after all, and this is (apparently) the place to be if you’re in the foodie restaurant game. The spawning of East Bay restaurants is an interesting phenomenon. While we have an insane number of new spots opening up, virtually all are second (or third or even fourth) restaurants for local restaurateurs. Let’s see, 2008 brought us Flora (Doña Tomás crew), Marzano (Garibaldi’s), Ozumo East (Ozumo), Mua (Soizic), and Franklin Square Wine Bar (Luka’s), among others. 2009 promises the spots listed above plus a second Bakesale Betty’s, a potential new Doña Tomás taqueria, a possible Pizzaiolo by-the-slice spot—and I recently saw a sign up downtown that Tamarindo is planning a new taqueria near City Center, while À Côté is apparently opening up shop in the Glenview. Jack London is also crawling with child-of-x openings and newly-inked leases. Not that I’m complaining—this is a list of some of my favorite Oakland spots! (Hey Wood Tavern, where’s your second restaurant?? We’ve been saving you a spot by the lake….) But it does seem to be a pronounced trend; possibly new restaurants are more manageable in this economy when they’re the offspring of established spots. They get a little name boost (and a financial/logistics boost, I imagine, in contrast to a complete newcomer). Only time will tell if there’s room in Oakland for the both of them, though. One last piece of good food news this week: the Alameda County Community Food Bank received a $50,000 grant from Chevron yesterday to help see them through the winter. They still need much more help, though, especially in this economy—and they’re one of the most effective organizations you can support, dollar for dollar. So don’t forget about them as you enjoy your holiday meals over the next week. Looking forward to a tasty 2009….and thinking good thoughts for Oakland’s newest restaurants and shops as we weather this recession as a community! You are currently browsing the archives for the The 'Hood category.